In the mid-1980s, the National Science Foundation (NSF) funded the establishment of NSFNET, a TCP/IP network that initially connected six NSF-funded national supercomputing centers at a data rate of 56 kilobits per second (kbps). NSF subsequently awarded a contract to a partnership of Merit (one of the existing research networks), IBM, MCI, and the State of Michigan to upgrade NSFNET to T-1 speed (1.544 megabits per second (Mbps)), and to interconnect several additional research networks. The new NSFNET "backbone," completed in 1988, initially connected thirteen regional networks. Individual sites such as universities could connect to one of these regional networks, which then connected to NSFNET, so that the entire network was linked together in a hierarchical structure. Connections to the federally-subsidized NSFNET were generally free for the regional networks, but the regional networks generally charged smaller networks a flat monthly fee for their connections. The military portion of ARPANET was integrated into the Defense Data Network in the early 1980s, and the civilian ARPANET was taken out of service in 1990, but by that time NSFNET had supplanted ARPANET as a national backbone for an "Internet" of worldwide interconnected networks. In the late 1980s and early 1990s, NSFNET usage grew dramatically, jumping from 85 million packets in January 1988 to 37 billion packets in September 1993. The capacity of the NSFNET backbone was upgraded to handle this additional demand, eventually reaching T-3 (45 Mbps) speed. In 1992, the NSF announced its intention to phase out federal support for the Internet backbone, and encouraged commercial entities to set up private backbones. Alternative backbones had already begun to develop because NSFNET's "acceptable use" policy, rooted in its academic and military background, ostensibly did not allow for the transport of commercial data. In the 1990s, the Internet has expanded decisively beyond universities and scientific sites to include businesses and individual users connecting through commercial ISPs and consumer online services. Federal support for the NSFNET backbone ended on April 30, 1995. The NSF has, however, continued to provide funding to facilitate the transition of the Internet to a privatelyoperated network. The NSF supported the development of three priority Network Access Points (NAPs), in Northern California, Chicago, and New York, at which backbone providers could exchange traffic with each other, as well as a "routing arbiter" to facilitate traffic routing at these NAPs. The NSF funded the vBNS (Very High-Speed Backbone Network Service), a noncommercial research-oriented backbone operating at 155 megabits per second. The NSF provides transitional funding to the regional research and educational networks, as these networks are now required to pay commercial backbone providers rather than receiving free interconnection to NSFNET. Finally, the NSF also remains involved in certain Internet management functions, through activities such as its cooperative agreement with SAIC Network Solutions Inc. to manage aspects of Internet domain name registration. "A fundamental part of the supercomputing initiative was the creation of NSFNET. NSF envisioned a general high-speed network, moving data more than twenty-five times the speed of CSNET, and connecting existing regional networks, which NSF had created, and local academic networks. NSF wanted to create an "inter-net," a "network of networks," connected to DARPA's own internet, which included the ARPANET. It would offer users the ability to access remote computing resources from within their own local computing environment." The traffic load on ARPANet was sufficiently large that it could not satisfactorily meet R&D needs. [Kahn, Role of Govt] "Following the CSNET effort, NSF and ARPA worked together to expand the number of users on the ARPANET, but they were constrained by the limitations that DOD placed on the use of the network. By the mid-1980s, however, network connectivity had become sufficiently central to the workings of the computer science community that NSF became interested in broadening the use of networking to other scientific disciplines. The NSF supercomputer centers program represented a major stimulus to broader use of networks by providing limited access to the centers via the ARPANET. At about the same time, ARPA decided to phase out its network research program, only to reconsider this decision about a year later when the seeds for the subsequent high-performance computer initiative were planted by the Reagan administration and then-Sen. Albert Gore (D-Tenn.). In this period, NSF formulated a strategy to assume responsibility for the areas of leadership that ARPA had formerly held and planned to field an advanced network called NSFNET. " the Cornell Theory Center , a production and experimental supercomputer center. NSF later established the Pittsburgh Supercomputing Center , which was run jointly by Westinghouse, Carnegie-Mellon University, and the University of Pittsburgh." In 1986, Stephen Wolf becomes Division Director for Networking and Communications Research and Infrastructure at NSF where he oversees NSFNET. In 2013, Wolff was inducted into the Internet Hall of Fame. "whenever -- (1) the principal purpose of the relationship is the transfer of money, property, services, or anything of value to the . . . recipient to accomplish a public purpose of support or stimulation authorized by Federal statute, rather than acquisition . . . of property or services for the direct benefit or use of the Federal Government; and (2) substantial involvement is anticipated between the executive agency, acting for the Federal Government, and the . . . recipient during performance of the contemplated activity." [S]ince the NSFNET was created as a resource for the U.S. research and education community, NSF was able to use a cooperative agreement as the award vehicle. Utilizing the cooperative agreement enabled the NSF to build and maintain a backbone network service in support of the research and education community while maintaining "a substantial involvement in the process," says Don Mitchell, Staff Associate at the NSF. A cooperative agreement was chosen as the award instrument for the NSFNET backbone because a contract is used only when procuring specific goods and services for the government, and a grant does not allow the government to significantly guide the management of a project. [NSFNET Final Report p 12] Cooperative Agreements would also be used by NSF for the administration of the domain name system by Network Solutions, Inc. The NSFNET project was overseen by NSF Division of Networking and Communications Research and Infrastructure. NSFNET 1.0 got off to a relatively modest start in 1986 with 56 kbps connections, using LSI 11/73 gateway systems with 512 kbytes of memory, among the five NSF university-based supercomputer centers. [NSFNET Final Report p 15] [Salus p 199] [Kesan p 100] [Cerf 1995 ("The backbone itself was initially implemented using gateways (systems used to route traffic) developed at the University of Delaware and links operating at the ARPANET speed of 56K bps.")] Yet its connection with ARPANET immediately put NSFNET into the major leagues as far as networking was concerned. As with CSNET, NSF decided not to restrict NSFNET to supercomputer researchers but to open it to all academic users. The other wide-area networks (all government-owned) supported mere handfuls of specialized contractors and researchers. The flow of traffic on NSFNET was so great in the first year that an upgrade was required. [NSFNET FR p 15 (describing backbone as "saturated")] NSF issued a solicitation calling for an upgrade and, equally important, the participation of the private sector. October: NSFNET experiences Congestion Collapse which leads to the implementation of Van Jacobson's Congestion Control in 1988. Merit's bid was for $14 m, substantially below the two other competing bids (the second bid was for $25 m and the third was for $40 m). The bid involved "an extraordinary degree of cost-sharing." It included $5 m from the state of Michigan for facilities and personnel, $6 m in reduced communication charges from MCI, and $10 m from IBM in equipment, installation, maintenance and operation. [NSF IG Sec. III]. The Merit team was responsible overall engineering, management, and operation of the project, as well as for developing user support and information services. [Project Solicitation 1992] [NSFNET Celebration (Van Houweling)] [Merit History] [NSFNet Final Report p. 7 (the Chair of the Board of MERIT at the time was Doug Van Houweling)]. MCI provided the transmission circuits for the NSFNET backbone, including reduced tariffs for that service. OFFICE OF SCIENCE AND TECHNOLOGY POLICY, A RESEARCH AND DEVELOPMENT STRATEGY FOR HIGH PERFORMANCE COMPUTING (1987). The increased bandwidth supply offered by the upgraded NSFNET caused a surge in demand. Usage increased on the order of 20 percent per month [Merit History] [NSFNet FR p. 27 (setting monthly growth rate at 10%)]. Civilian NSFNet had to gain admittance to DOD IETF. Morris Worm ripped through the network. (1) NSFNET Backbone services are provided to support open research and education in and among US research and instructional institutions, plus research arms of for-profit firms when engaged in open scholarly communication and research. Use for other purposes is not acceptable. (2) Communication with foreign researchers and educators in connection with research or instruction, as long as any network that the foreign user employs for such communication provides reciprocal access to US researchers and educators. (3) Communication and exchange for professional development, to maintain currency, or to debate issues in a field or subfield of knowledge. (4) Use for disciplinary-society, university-association, government-advisory, or standards activities related to the user's research and instructional activities. (5) Use in applying for or administering grants or contracts for research or instruction, but not for other fundraising or public relations activities. (6) Any other administrative communications or activities in direct support of research and instruction. (7) Announcements of new products or services for use in research or instruction, but not advertising of any kind. (8) Any traffic originating from a network of another member agency of the Federal Networking Council if the traffic meets the acceptable use policy of that agency. (9) Communication incidental to otherwise acceptable use, except for illegal or specifically unacceptable use. (10) Use for for-profit activities unless covered by the General Principle or as a specifically acceptable use. Traffic projections indicated that the NSFNET would reach the limits of its T1 capacity during the next year. [NSF IG Sec. III.B.1] "When we first started producing those traffic charts, they all showed the same thing-up and up and up! You probably could see a hundred of these, and the chart was always the same," says Ellen Hoffman, a member of the Merit team. "Whether it is growth on the Web or growth of traffic on the Internet, you didn't think it would keep doing that forever, and it did. It just never stopped." Merit began to plan for an upgrade of NSFNET from T1 (1.5 megabits per second or Mbps) to T3 (45 Mbps). [Cook] [OSTP, "The Federal High Performance Computing Program," (8 September 1989) (recommending migration of NREN to T3)] The T3 upgrade, like the original network implementation, deployed new technology under rigorous operating conditions. The upgrade, therefore, represented an organizational as well as a technical milestone-the beginning of the Internet industry. [NSFNET Celebration (Van Houweling) (describing the upgrade from T1 to T3 as the greatest technological challenge)] The breadth of the project before them lead to the proposal to outsource network management to a new entity, Advanced Networks and Services. "Funding for four of the centers, San Diego, Urbana-Champaign, Cornell, and Pittsburgh, was renewed." [The Launch of NSFNet, NSF] NSF also funded several new nodes to the NSFNET. [NSFNet FR p. 28] Merit's funding increased from $14 m to $20 m based on the increase of traffic on the network and the additional nodes. An Atlanta node was added to NSFNET, for a total for 14 nodes. the reimbursements will be used to enhance the network infrastructure and services, in order that the level of service provided by MERIT under its Cooperative Agreement with the NSF not be diminished. The creation of ANS led to a controversy that would lead to Congressional Hearings, an NSF Inspector General investigation, and the creation of the COM-PRIV email discussion group, discussed below. In March 1991, the Internet was transferring 1.3 trillion bytes of information per month. The new T3 service was fully inaugurated over Thanksgiving, representing a thirty fold increase in the bandwidth on the backbone. [Merit History] The network linked sixteen sites and over 3,500 networks. The T3 nodes utilized IBM RS/6000 workstations running UNIX, which did the same work as nine IBM RTs that had made up the previous NSS's, but at a faster speed. [NSFNet Final Report p. 28]. May 24, "NSF agrees that ANS may move commercial traffic in both directions across the NSF sponsored Backbone gateways." [Cook pt 3 (quote email from Steven Wolff, NSF to Eric Aupperle, MERIT (May 24, 1991)] This led to the May 30th incorporation of a for-profit ANS CO-RE, Inc. [NSF IG Sec. III.C.1] [Srinagesh 143] On August 14, ANS announced its Plan for Commercial Services. [Cook pt 3] Cook argues that ANS's planned customer base were those regional networks that were receiving network service from the non-profit NSNFNET. "(1) ANS recovers at least the average cost of the commercial use that traverses the NSF sponsored gateways. "(2) Excess revenues recovered above costs for this use after tax will be placed in a pool to be distributed. "(4) MERIT and ANS ensures that the attachment and service sponsored by the NSF under Merit's Cooperative Agreement with the NSF is not diminished. "NSF, MERIT and ANS will agree on the technical means of compliance with the points outlined above." Of course segregating commercial traffic over the backbone from academic and research traffic would be a bit of a challenge. Any network that did want to exchange commercial traffic over the NSFNET would have to execute a contract with ANS and become a customer for ANS, distinct from NSFNET. High-Performance Computing and Communications Act of 1991: Hearing Before the Subcomm. on Science, Tech., and Space of the Senate Comm. on Commerce, Science, and Trans., 102d Cong. 90 (1991). According to George Strawn, there were two main issues of concern with regard to the so-called "commercialization and privatization of the Internet." One was what effects the NSF's ongoing support of the NSFNET would have on the fledgling Internet service provision market; new companies such as Performance Systems International (PSI) and AlterNet charged that the NSF was unfairly competing with them. 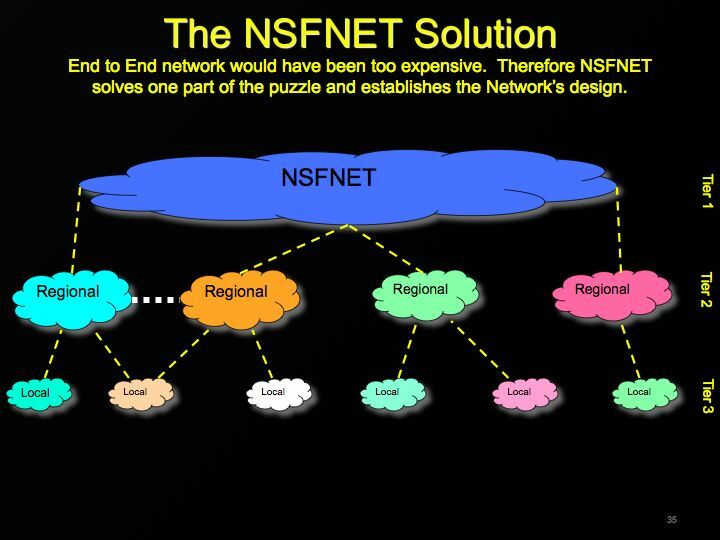 The second issue was the research and education community's concern that "commercialization"-part of which was the perception that ANS would provide the NSFNET backbone service instead of Merit-would affect the price and quality of their connection to the NSFNET and, by extension, the Internet. They wanted to "keep it in the family," says Strawn. On yet another front, the regional and midlevel networks were beginning to attract commercial customers, and wanted that business for much the same reasons that ANS was created: to support themselves and the research and education community. However, they felt constrained by the NSF's Acceptable Use Policy, which specified the nature of traffic allowed to traverse the NSFNET backbone service. Purely commercial traffic was not directly in support of research and education and was thus restricted from the NSFNET backbone. "Something had to happen to break loose the whole commercial issue," says Ellen Hoffman. Abstract: " The Science Subcommittee began its oversight of the implementation of the High-Performance Computing Act of 1991 by focusing on the establishment of the National Research and Education Network (NREN), which will evolve out of the current internet, the National Science Foundation's (NSF) NSFNET. The policy issues under discussion were: providing a level playing field for network services providers; ensuring that the network is responsive to user needs; providing for effective network management; determining the level of consultation that has occurred between the NSF, the network user, and provider communities during the course of developing the policies for governance and operation of the NSFNET backbone; and moving toward the long-term vision for the NREN, including the appropriate roles of the public and private sectors. Included in the hearing report are statements from Bob Traxler and Jerry F. Costello of the House Subcommittee on Science and testimony from the following witnesses: Eric Hood, Federation of American Research Networks and Northwestnet, Inc.; Douglas E. Van Houweling, Merit Network, Inc. and the University of Michigan, Ann Arbor; Mitchell Kapor, Commercial Internet Exchange Association and Electronic Frontier Foundation; Michael M. Roberts, Educom; William L. Schrader, Performance Systems International, Inc. Also included are a statement by A. Nico Habermann and Stephen S. Wolff, National Science Foundation; the Subcommittee and Full Committee markups of H.R. 5344, Amendment to the NSF Act of 1950; and an additional statement submitted for the record by E. Michael Staman, CICNet. (ALF)"
This hearing led to a request from Rep. Boucher to the NSF Inspector General to conduct an investigation of NSFNET. [NSF IG Sec I] A summary of the IG's report, released in 1993, is provided below. The handing over of the infrastructure of NSFNET to a commercial entity made some of the other commercial network suppliers a bit queasy: After all, the NSFNET, built with taxpayer's funds, would not be in competition (as ANS) with private entities, and ANS had agreed with MERIT (in November 1992) to "monitor commercial traffic" on the backbone to ensure that commercial users weren't eating into the bandwidth promised to NSF research and education clients. The NSF chose a vendor and a model on its own initiative to do commercialization using the same infrastructure as the NSFNet called ANS (Advanced Network Services) led by IBM Yorktown Heights. While the conflict (with the efforts of UUNET, PSINet, CIX and other private networks) was apparent to some it was not to the NSF. More importantly the NSF and ANS had a settlement model which they believed would provide for an Internet for themselves and commercial entities, this settlement model was based on how many bytes of data were sent to you. This model had great advantages to those who provided servers in the center of the Internet which of course was the situation that the NSFNet and ANS happened to be in. This "great debate" was had in very select forums amongst very select parties until the establishment of the "com-priv" public mailing list at PSInet (specifically com-priv@psi.com). In retrospect, such growing pains were unavoidable, considering the scope of the technological achievement and importance of networking and communications infrastructure to academic (and commercial) users. Thus the upgrade of the NSFNET backbone service to T3 was not only a technological and organizational challenge of the highest order. It also precipitated a greatly needed, though contentious, community dialogue about the evolution of the communications infrastructure that had come to mean so much to the research and education community and, increasingly, the society as a whole. The situation with ANS might be contrasted with the relationship NSF had with Network Solutions (NSI) for DNS services. NSF used its cooperative agreements with NSI in order to contract out the function of administering the domain name system. Like the arrangement with ANS, NSF was using government funds to set up one private company to offer Internet services, without having complete contractual control over how those services were administered. Unlike a government contract, the assets created pursuant to a cooperative agreement were the property of the private company with no further government recourse. This put NSF in the position of funding one company's R&D and hand picking the first mover in a market. The situation with ANS was surpassed by CIX and private commercial networks; the situation with NSI and DNS however took a great deal more consternation ultimately leading to the Department of Commerce taking over responsibility and the formation of ICANN. "The Foundation is authorized to foster and support the development and use of computer networks which may be used substantially for purposes in addition to research and education in the sciences and engineering, if the additional users will tend to increase the overall capabilities of networks to support such research and education activities." By 1992, over 6,000 networks were connected, one-third of them outside the United States. that commercial Internet Service Providers would replace NSFNET, and would interconnect at Network Access Points (NAPs). "A Routing Arbiter (RA) would then manage a routing database and provide routing information to the NAPs to ensure orderly exchange of traffic." Very High Speed Backbone Service vBNS would replace NSFNET for high speed research and academic connectivity. "NSF's decision to award the Cooperative Agreement for NSFNET to Merit was reasonable." NSF's proposal to upgrade NSFNET to T3 was reasonable. The NSFNET solicitation envisioned expansion and improvement of the network and therefore it was reasonable to amend the Cooperative Agreement as oppose to initiating an new solicitation. "NSF reasonably concluded that allowing commercial use of the network -- with the conditions NSF imposed -- is consistent with NSF's overall statutory mandate "to foster the interchange of scientific and engineering information among scientists and engineers" and "to foster and support the development and use of computer and other scientific and engineering methods and technologies, primarily for research and education in the sciences and engineering""
"In view of the fact that the objectives of the program were furthered by commercial use of the network, the mere fact that an unexpected benefit accrued to the awardee is not objectionable and would not require a re-solicitation." "At least for the term of the NSFNET Cooperative Agreement, CO+RE's after-tax profits will fund the infrastructure pool, to be distributed according to the principles discussed above; even after the term of the Cooperative Agreement, if the profits are received by ANS in the form of dividends, they must be used in a manner consistent with ANS's tax-exempt status." "NSF has publicly stated that if another company wishes to send commercial traffic over the T3 network set up by NSF and Merit/ANS, it can do so on the same terms accorded to CO+RE." "The NSFNET program is a paradigm for the use of a cooperative agreement "
"By the end of 1994, NSFNET was transmitting 17.8 trillion bytes per month, the equivalent of electronically moving the entire contents of the Library of Congress every four months." April 30: NSF decommissioned NSFNET. The public Internet is born. The very high speed Backbone Network System (vBNS) and the Next Generation Internet (NGI) are funded in part by NSF. NSF and MCI are entirely responsible for vBNS. The vBNS is a nationwide network that operates at a speed of 622 megabits per second using MCI's network of advanced switching and fiber-optic transmission technologies. At speeds of 622 megabits per second, 322 copies of a 300-page book can be sent every seven seconds. Launched in April 1995 the vBNS is the product of a five-year cooperative agreement between MCI and NSF to provide a high-bandwidth network for research applications. The vBNS is only available for meritorious research projects with high-bandwidth uses and is not used for general Internet traffic. The vBNS provides to NSF-designated organizations a high-performance production research platform with service features and performance characteristics designed to be one step ahead of what is currently available with the commercial Internet. What's the difference between the vBNS and the Internet? The Internet is a ubiquitous network that has become an information tool for researchers, students, teachers, business and the general public. The vBNS is a noncommercial research platform for the advancement and development of high-speed scientific and engineering applications, data routing and data-switching capabilities. NSF's vBNS is the key part of the NGI efforts. The NGI is the product of DOD, DOE, NASA, NIH, and NIST and NSF. As NSF worked to privatize the mainstream Internet in the mid-1990s, the foundation also signed an agreement with MCI in April 1995 to establish the very-high-performance Backbone Network Service (vBNS) . Without competition from general Internet traffic, the vBNS permitted advanced networking research and the development of novel scientific applications. The vBNS initially connected the NSF supercomputer centers and NSF-specified Network Access Points, where linked the vBNS to other research networks. The vBNS began operating at speeds of 155 megabits per second (Mbps), or OC-3, at a time when the fastest general Internet links operated at 45 Mbps. In 1997, the vBNS backbone was upgraded to 622 Mbps (OC-12). The vBNS also supported new technologies, such as IPv6, to meet the special needs of advanced applications. By 2000, the vBNS backbone was upgraded to 2.4 gigabits per second (OC-48). In 2000, NSF awarded MCI a three-year, no-cost extension to continue operating the vBNS for university customers; commercial connections to vBNS were also offered for the first time. With the start of the vBNS, NSF began a series of programs designed to help universities and research institutions join advanced high-performance research networks. In its eight-year history, the High-Performance Network Connections program helped 250 institutions enhance their high-end network connectivity. "The NSFNET backbone glued together the international networks-almost all traffic from abroad would transit the NSFNET. With that kind of connectivity available, other countries were prompted to build their own networks so they could get connected too. Many of them used NSFNET's three-tiered structure-backbone, regionals, campus networks-when they started to build their own networks." [NSFNET FR p 34] This was true domestically as well as internationally. ARPANet had successfully established what could be done with packet switched networks. With ARPANets proof of concept came a cacophony of national, regional, and local data networks. NSFNET was the historical glue that transformed Babylon into a network of a single voice - the Internet speaking TCP/IP. NSFNET was the incubator for the commercial networks that would launch in the early 1990s and become the initial Tier 1 backbone networks. With NSFNET, NSF was in the process of giving birth to the Public Internet. The problem was, NSF did not want to be the "public" in Public Internet. This void led to public policy anxiety; how do we resolve the "public" in Public Internet. This anxiety leads to the creation of ICANN and the Network Neutrality debates. "Since the earliest days of the telegraph and the telephone, history tells us that the arrival of each new communications medium has been accompanied by grandiose claims of its potential benefits to society. In order to take advantage of the exciting opportunities afforded by today's technology, it is imperative that policy makers examine the development of the NSFNET and the Internet. We are still far away from a truly open, interoperable, and ubiquitous global information infrastructure accessible to all, "from everyone in every place to everyone in every other place, a system as universal and as extensive as the highway system of the country which extends from every man's door to every other man's door," in the words of Theodore Vail, president of AT&T in 1907. However, the Internet has brought us a giant step closer to realizing the promise of high-speed networking, one of the most revolutionary communications technologies ever created. As part of this phenomenon, the NSFNET backbone service provided a model for future partnerships as well as a legacy of technology for the world." This is a Flickr badge showing public items from Flickr tagged with NSFNET Celebration. Make your own badge here. Retiring the NSFNET Backbone Service: Chronicling the End of an Era By Susan R. Harris, Ph.D., and Elise Gerich Reprinted with permission from "ConneXions", Vol. 10, No. 4, April 1996. "NSFNET: Bringing the World of Ideas Together", Merit Network, Inc. (1992). Kesan, Jay P. and Shah, Rajiv C., Fool Us Once Shame on You - Fool Us Twice Shame on Us: What We Can Learn from the Privatizations of the Internet Backbone Network and the Domain Name System. As published in Washington University Law Quarterly, Vol. 79, P. 89, 2001. Hans Werner Braun, "The NSFNET Routing Architecture," Merit Computer Network, May 1988; republished as SRI Network Information Center RFC 1093, February 1989.